I was told he was a boy, the vet, however, confirmed he was a she. So we had a female guinea pig named Gunther. 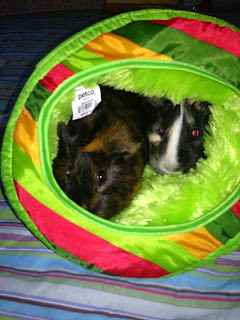 As my four year old says, she turned out to be "cray-cray" and liked nothing more than running around in spastic circles, annoying our formerly male, now female guinea pig. We brought Elsa back, apologetically. Another guinea pig, Cleo, ready to be adopted to a good home, was staring me in the face with HER big guinea pig eyes. How could I say no? I had not one, not two, but three employees confirm that she was a female guinea pig. Cleo is so mellow and sweet. Like a dog but of guinea pig proportions. She came home and met Gunther for ten magical minutes. They seemed to get along nicely; two sororal companions. But I decided to keep them in separate cages until Cleo was confirmed to be a female by someone other than a Petco employee. Cut to Cleo's vet appointment. "Weren't you the one who had the guinea pig you thought was a boy?" said the vet upon seeing me. "Yup, that's me!" He took a look at Cleo. A long look. "Cleo's a boy!" he announced, a little too enthusiastically. "I guess I have to give her back then," I resolved. I didn't want guinea pig babies. "Well, you could neuter him," said the vet. I had no idea they did that. It seems overkill for a rescue guinea pig. I told 8 year old, Mr. P. the situation. I said we could return Cleo or give HIM a small operation so he won't make babies with Gunther. His response was, "Cleo is my best friend in the whole world. Why would I give her back?" "HIM," I said. "Give HIM back." I failed to remind him that he had yet to touch, hold or even look at his new "best friend." So, it was decided. Cleo is being snipped today, Christmas Eve. We hope we have not ruined his holiday. We also hope that Gunther doesn't give birth to their love children ten weeks from now. Anyone want a baby guinea pig??? Just in case, I'm taking numbers. Cleo is home and recovering. He is on antibiotics and pain killers and I am feeding him water with a syringe, which means I have officially become crazy guinea pig lady.